Laying a wooden floor in one or more rooms in your house can transform it. There’s nothing like a gleaming wooden floor to give the effect of luxury and comfort and the great news is that it’s a viable DIY project. There are many types of wood and wood effect flooring but oak flooring is one of the most popular, with good reason. It’s a solid, reassuring wood with a traditional feel and a mid-range colour that looks good in all homes, whether sleek and modern or older and cosy. What’s the difference between laminate, solid wood and engineered wood? Oak flooring is available in different grades of wood or wood effect. Laminate, or wood effect, flooring is extremely popular as it’s hard wearing and very affordable. 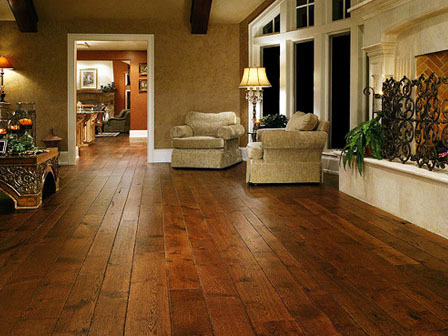 Solid wood is the most expensive as the floor boards are each made from one piece of real wood. Engineered wood is somewhere in between – it’s still real wood but is more versatile and less expensive than solid wood. Laminate flooring contains many layers of materials, usually fibre board and melamine resin, which are forced together under pressure. A photograph of real wood, such as oak or pine, covers the board followed by a clear resin layer to protect it. As it’s not real wood, laminate oak flooring is relatively inexpensive and looks surprisingly realistic. Solid wood flooring is just that – pieces of solid wood cut into floor boards. Because of this, it’s costly to buy but it will last a long time. Engineered wood is still real wood but instead of being solid, the floor boards are made up of several layers of wood which are glued together and then covered with a hardwood veneer. Which type of oak flooring is better? No one type of oak flooring is better than the other – it depends on what you want to use it for and how large your budget is. If you can afford it, solid wood oak flooring will last a life time and tends to improve its appearance as it ages. If it’s damaged, it can be sanded down and then re-varnished to make it look as good as new. However, it’s not suitable for use in every room – it would not be advisable to use it in a bathroom, for example, where it may get damp or wet as it could cause it to warp over time. Engineered wood oak flooring is more versatile than solid wood but still has the real wood feel. Unlike solid wood, it can be laid on most sub floors and some types of engineered wood flooring may be suitable for use in bathrooms. It’s a more cost-effective way of installing a real wood floor. Laminate oak flooring has the advantage of being affordable and very versatile. It’s probably the best type of wooden flooring to use in bathrooms, although it’s still advisable to mop up any lying water straight away. However, because it contains no real wood it’s not as durable and long lasting as the other types of flooring, particularly in high traffic rooms. A laminate floor is likely to need replacing after 10 to 20 years, depending on the thickness of the planks. Should my oak flooring be installed professionally? Most wood flooring is designed to be easy to lay and install. The boards will have a locking system making them reasonably straightforward to slot into place. Laminate flooring is relatively quick and easy to lay as the boards should just click together. The real wood floors will need some nailing or gluing, making the job more time consuming. If you’re relatively confident with DIY projects laying a wooden floor should pose no problems provided you follow the manufacturer’s instructions and ensure you have the correct type of underlay and damp proof membrane. If you are laying the floor yourself, make sure you leave some space for expansion at the edges of the room. It’s recommended to either replace the skirting or lay scotia next to the skirting to cover the expansion gap. Similarly, you’ll need a threshold strip to cover the expansion gap in a doorway and to give a neat finish to the floor.